The season put in by University School out of Davie makes this a fairly easy decision. Coach Adrian Sosa and hit team won the prestigious City of Palms tournament, lost only to national #2 ranked Oak Hill and breezed thru the Class 5A playoffs. Consequently, they are a considered a top five national team by every respectable poll. Their season is not done yet as they have accepted an invitation to the Geico High School Invitational where they are slated to meet another nationally-ranked one loss team in Shadow Mountain, Arizona. Doral Academy wasn’t accorded much respect come playoff time this season. Sure, they only had two losses as opposed to 27 wins but the gauntlet to get to Lakeland would be exceedingly difficult. They won by six at home against a talented Carol City squad. The then did what rarely happens: defeated Miami Norland AT Norland to reach the regional final. By virtue of them winning on the road, Doral Academy got to host a hyper-aggressive Oakland Park Northeast, and won by six. They then defeated Cape Coral and the favorite Choctawhatchee to win the Class 7A title. Just like UMBC beating Virginia in the opening round of the NCAA Tournament: Didn’t see THAT coming. Wouldn’t it be great if Florida followed in New Jersey’s footsteps and held a Tournament of Champions for all of its classification winners? If that had taken place this season, below is our seeding for the bracket. #2 Seed: Orlando Oakridge – The Pioneers have been nationally-ranked all season. How great it would be to see a game between them and the Sharks of U-School. #3 Seed: Leesburg – The state champ in Class 6A, the Yellow Jackets did not lose to an FHSAA program in the regular season. 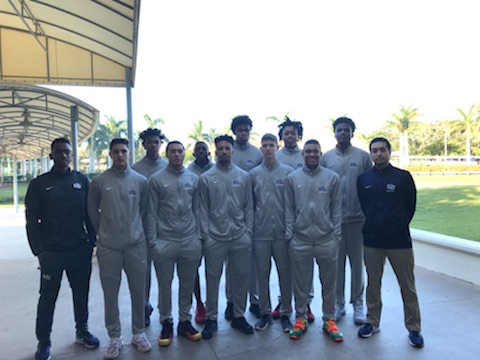 #4 Seed: Orlando Christian Prep – They took on a challenging schedule and had a head-scratching loss or two but no denying this powerhouse is one of the best teams in the state regardless of classification. #5 Seed: Fort Lauderdale Westminster Academy – Had a stellar year in winning its second consecutive 3A state title. #6 Seed: Miami Christian – The Victors played four of the eight other state winners during the regular season. They lost by 12 to OCP and 8 and 11 respectively the two times they played Westminster. In the win column, they defeated Doral Academy by four points in overtime and took down Ely by a dozen. #7 Seed: Doral Academy – seed might by too low as Doral caught fire at just the right time in the state playoffs. #8 Seed: Ely – With the seedings being based on regular season results, this is a controversial low seeding for the Tigers. Melvin Randall’s club is built for the post-season, not necessarily regular season success. #9 Seed: Wildwood – Class 1A champ would love an opportunity to play against the “big boys”. Class 1A: Madison County – Travis Jay will return and will most likely be the top player in the classification. That means a lot in the state’s smallest classification. Class 2A: Quincy Crossroad Academy – A young program near Tallahassee, they will return every one of significance for a 21-7 district champ. Junior Dedric Streeter averaged 14 points and 8 rebounds a game while 8th grader Jaylen Martin impressed. Class 3A: Tallahassee John Paul II – The team will return three double figure scores from this 20 win season. Patrick Copenhaver (sophomore), Logan Roberts (junior) and Chosen Levarity (junior) who averaged 15 points and 12 rebounds this past season, look to get out of district play and make noise in the regional round. Class 4A: Jacksonville Providence – Coach Martin’s club usually has annual reservations in Lakeland but fell short this past season. The fell to P.K. Yonge by a point on the road in the regional finals. Ahren Freeman will be a senior and will get significant help from Josh Himmel and big man James Repass. Class 5A: Ocala Trinity Catholic – Head Coach Carlos Villalobos returns all five starters from a team that reached the state title game this season. A year of experience and physical growth and maturity should do wonders for the Celtics. CLASS 6A: Fort Lauderdale Stranahan – Starting four sophomores and a junior, Stranahan was the talk of Broward County all season long. They reached the regional finals and look in good shape to take that next step in 2019. CLASS 7A: Punta Gorda Charlotte – The Tarpons could be the top team in Southwest Florida next season. The will return quality and quantity next season with Ahmad Johnson and Makai Reeves creating a potent scoring combo. CLASS 8A: Jacksonville First Coast – This team was stunned in the first round of the regionals at home so you know they can’t wait to get the next season started. Nasseem Khallid will again by the leader of an athletic group that likes to get up and down the floor. CLASS 9A: Kissimmee Osceola – This group will return all five starters and four of them played key roles when the Kowboys won the state title in 2017. The core of Josh Marte, Isaiah Palermo, and Omar Payne want nothing more than to finish out their high school careers with another state title.